Nangoku Shirei!! 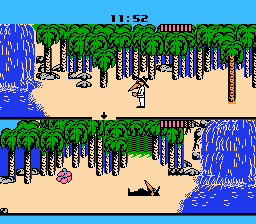 : Spy vs Spy is an action strategy game for the Nintendo Entertainment System. 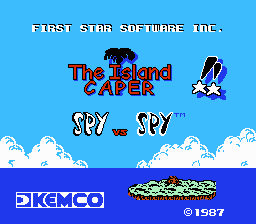 This is the English translated version of the sequel to the NES game Spy Vs. Spy. 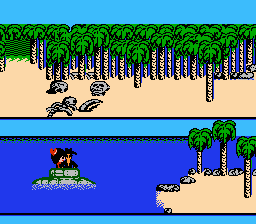 In this follow-up to the first Spy vs Spy game the spies are now stranded on a desert island after bailing out of the planes they escaped from in the first game. 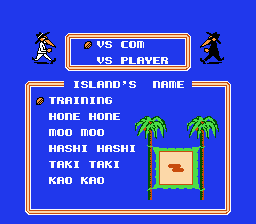 This time, instead of the four items which allow you to leave for the airport, the spies must try to collect 3 pieces of a missile. If you don’t do it within a time limit a volcano will erupt and destroy the entire island. There are new traps and a single gun to take part in combat, rather than the big sticks of the previous game.